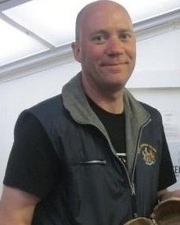 The Freezers Hit the Road | What's In John's Freezer? Who needs “Ice Road Truckers” when you have the “John’s Freezer” team on the road with fossils, amphibians, felids and 3D phenotype fun? No one, that’s who. We’re rocking the Cheltenham Science Festival for our first time (as a group), and pulling out all the stops by presenting two events! Here’s the skinny on them, with updates as the week proceeds. 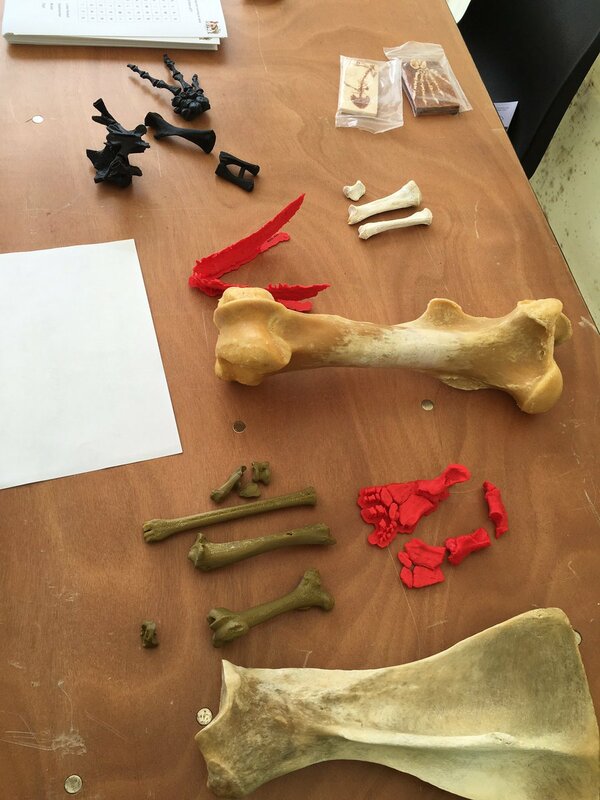 Right now, Lauren Sumner-Rooney (of “Anatomy To You” and other fame) is on-site with a rotating team of others from our lab, in the “Free Activity Tents” area of the Imperial Gardens/Square, inside a marquee where we’ll be showing off our NERC-funded tetrapod research all week. This “First Steps” event features not only our past and present work with Jenny Clack, Stephanie Pierce, Julia Molnar and others on Ichthyostega & its “fishapod” mates, but also our “scampering salamanders” research in Spain, Germany and England. 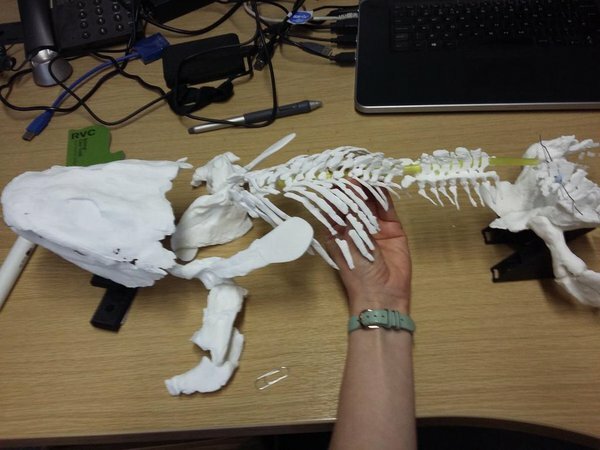 I’ve blogged a lot about all that, and won’t repeat it here, but you can see a 3D-printed Ichthyostega skeleton, view the skeleton in a virtual reality 3D environment, see related specimens and engage in kid-friendly activities, and talk to our team about this and other related research. 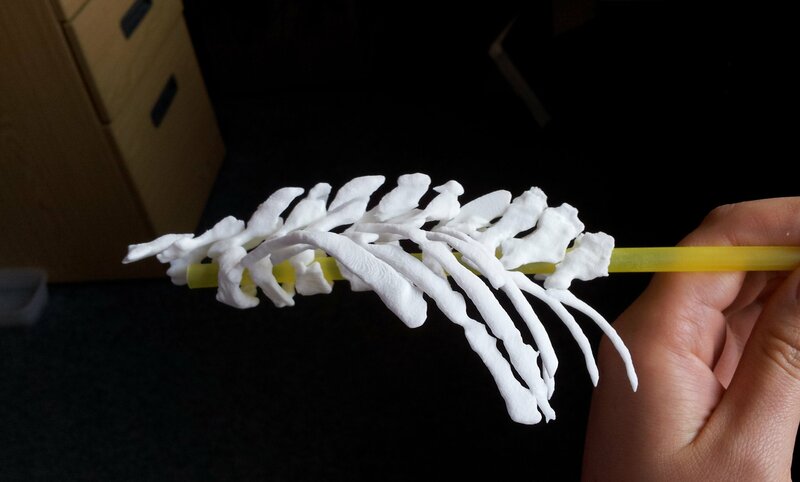 Ichthyostega 3D printed backbone is born! The central themes of that event are how bone structure relates to function and how we can use such information, along with experimental measurements and computer models of real salamanders, to reconstruct how extinct animals might have behaved as well as how swimming animals became walking ones. How did fins transform into limbs and what did that mean for how vertebrates made the evolutionary transition onto land? If you know my team’s work, that encapsulates our general approach to many other problems in evolutionary biomechanics (e.g. how did avian bipedalism evolve?). Added benefits are that you too can explore this theme in a hands-on way, and you can talk with us about it in person. That continues all week (i.e. until Saturday evening); I’ll be around from Thursday afternoon onwards, too. Kids of all ages are welcome! 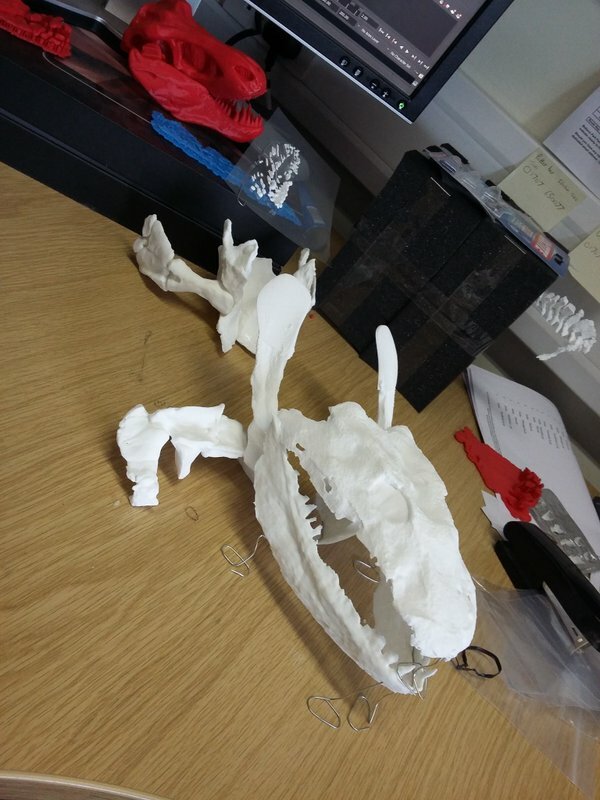 Ichthyostega 3D print taking shape! Then, on Saturday for our second free event we join forces with Ben Garrod (master of primate evolution, the secrets of bones, and “Attenborough and the Giant Dinosaur”) and RVC’s forensic pathologist Alexander Stoll as well as Sophie Regnault (“sesamoid street” PhD student w/me). As the “Large Animal Dissection” title hints, it’s not the right kind of gig to bring small kids to. There will be blood and stuff— we’ll be dissecting a cheetah together from 10am-4pm. This will involve walking through all the major organ systems, giving evolutionary anecdotes, and plenty more, with an aim to understand how the magnificent adaptations of cheetahs evolved—but also to investigate what problem(s) this animal faced that led to its sad demise. By the day’s end, there will just be a skeleton left. Get a front row seat early for this event, which serendipitously ties into “Team Cat”’s Leverhulme Trust-funded research project (we wanted a big animal and it just happened to be a cheetah; I had hoped for a giant croc or a shark or something but can’t complain!). Ichthyostega 3D print is ready! If you miss these events, please do cry bitter tears of regret. But don’t despair, there will be another “big cat dissection” in the London area in ~November (watch here for details), and plenty more fossil tetrapod stuff to come, plus a LOT more dinosaurs on the horizon! And please come back to this blog post for more pics and stories as the week carries on… For hashtag afficionados, you can follow the fun on Twitter etc. at #firststepsCSF16. What a world we live in! Tetrapod evolution: Tiktaalik to salamanders! Our poster/banner display looks nice. Our tent brings in some punters. Our bones excite people young and old, sighted and blind. Fun with stickers and lab t-shirts. Sophie and Alex help us get set up in our tent. Our initial rough schedule- although we ended up improvising more after lunch. The beast revealed. It was skinned by the museum that loaned it to us. Alex showing his talent: removing the viscera in one piece from end to end, starting with the tongue. Impressive finding of a surgical fixture (plate and wires) on the tibia, which had been used to hold the shattered bone back together long enough for it to heal. Added to the kidney disease and liver-spleen-lung cancer, this cheetah was in the sorriest shape of any cadaver I’ve seen yet. Cheetah coming to pieces: (from bottom) lumbar/pelvic region, hindlimb, thorax, forelimb and other bits. Dr Adam Rutherford, an eye expert, did a nice dissection of the cheetah’s eye, here showing the tapetum lucidum (reflective membrane), which shows up as light blue colour. Its small size befits the not-very-nocturnal habits of cheetahs. The lens of the cheetah’s eye. Now cloudy because of dehydration and crystalization, but still fascinating to see. Want to see more images and the enthusiastic responses from the audience (we got some great feedback)? Check out Twitter’s #cheltscifest feed, or more simply my Storify condensation of the cheetah-related tweets here. The big ones are right scapula and right femur of Equine. Dear John! Publick dissection of cheetah will be great! But where are the famous overlapping ribs of Ichthyostega? Were they gnawed by your 3D printer? Thanks Alex– yeah the ribs don’t print so well.